We are proud to announce the launch of our new and totally exclusive Alchemy Pure AIR. The concept behind the Alchemy PURE is simplicity. We have kept everything about the design and aesthetics minimal to give you a solid and reliable skate. The shell is pure white giving you a blank canvas that you can customise to fit your own style. 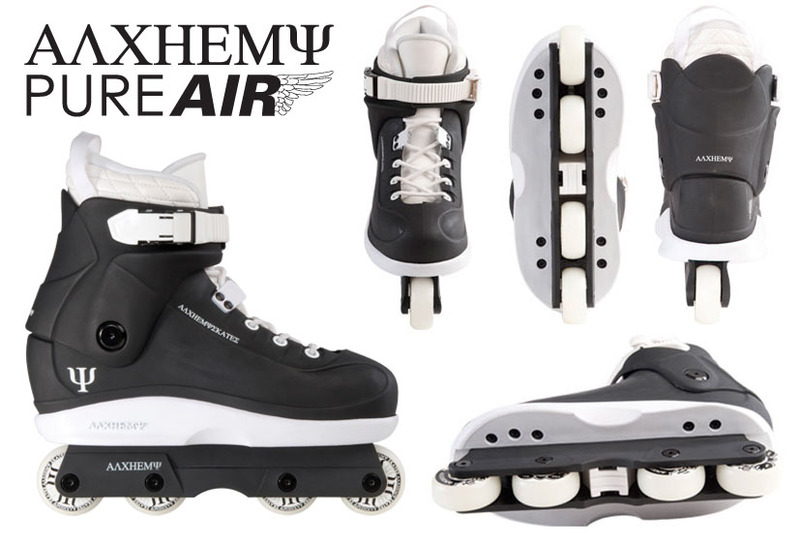 The AIR features our exclusive sole plate that has been designed, developed and tested by Alchemy riders. The strong one piece sole plates are made from lightweight PA material that will give you the perfect combination of control and speed when grinding. The outer and inner soles come with plenty of space to develop sole based grinds. The backslide grooves are centrally aligned with the h-block to assist when balancing grinds. The backslide area is well defined meaning the grooves wear to a riders individual style. We have continued with the minimal feel, featuring stylish and subtle details. BOOT: Two piece Pure PU Hard boot with exclusive Alchemy sole plates, spring buckle and lace lock system. Stylish stitched detail on the ultra comfort liner with oversized shock absorbing heel pad. We have all spare parts in stock including soles, liners, wheels, axles, cuff bolts and buckles. 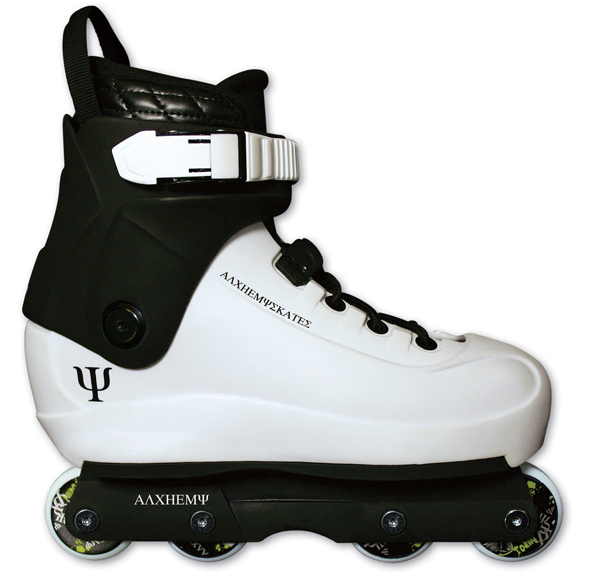 The Alchemy PURE skates were released in February 2009 and have now sold out. The concept behind the Alchemy PURE is simplicity. 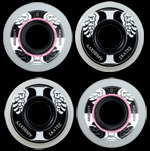 We have kept everything about the design and aesthetics minimal to give you a solid and reliable skate. The shell is pure white giving you a blank canvas that you can customise to fit your own style. The FKL.1 is the lightest skate for under �200 retail. The boot has been constructed with PE material which enables the boot to be light and flexible yet still strong and supportive. The ultra comfort liner has a gel shock absorber fitted in to the sole which cushions the heel from any heavy landings. Each complete skate weighs in at just 1700g* making this skate one of the lightest skates on the market. All of the Alchemy wheels are made of the highest quality urethane and are available in different sizes and hardnesses. They are printed both sides and come in a great presentation box of four wheels. 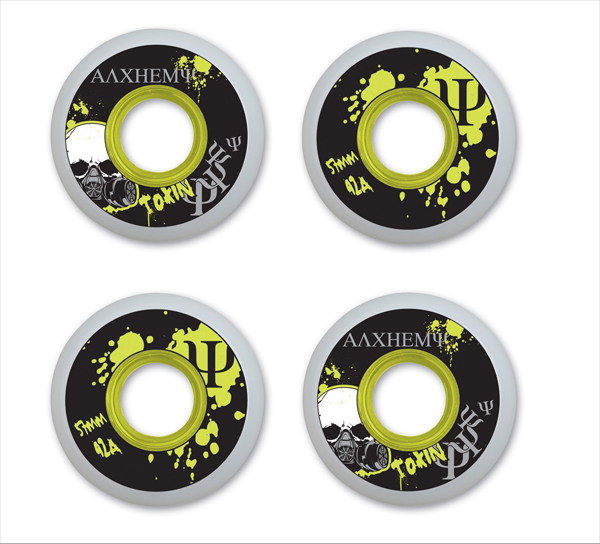 Alchemy Toxin wheels are made from long lasting and extremely durable urethane. 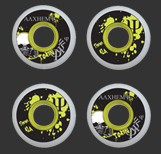 They are 57mm/92A wheels and are available in sets of 4.